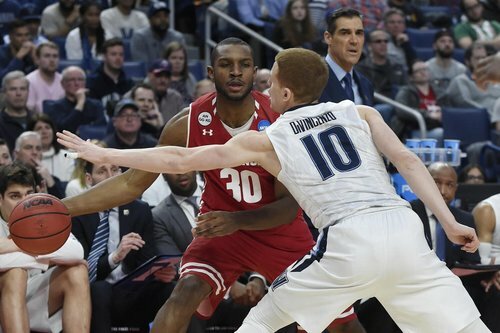 Villanova claws back into it behind 7 points from DiVincenzo. Vitto Brown leading the #Badgers with 6 points. Two fouls each on Ethan Happ and D'Mitrik Trice. 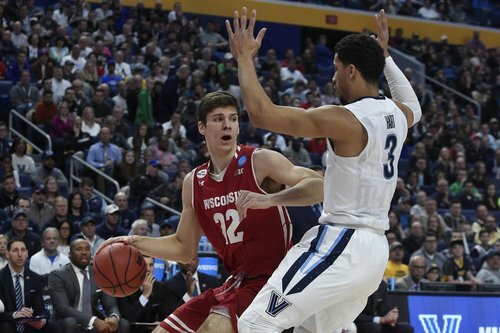 Losing Happ, probably for rest of half, puts #Badgers in a tough spot. Go ahead, put on another show BK. We wouldn't mind. Nigel Hayes... AND A FOUL! ???? Nova has 15 points -- 7 on second chances. #Badgers Trice is really struggling today. Coming out again. Rough start for D'Mitrik Trice. Two fouls, bad turnover. #Badgers lead 20-17 with 8:24 left. An 8-0 spurt by the Badgers gave them a 20-12 lead. But five straight points by Josh cuts the gap to 20-17. 8:24 to play in first half. Josh Hart leads all scorers with 10 points. He also has three of Nova's four turnovers. #Badgers ' young players are playing like young players. Veterans solid so far. Trice, Iverson have to get it together quickly. UW 8-for-12 from the field, 3-for-6 from 3-point range. But it has five turnovers in 16 possessions. Josh Hart with 10 and Donte DiVincenzo with 7 for Nova. #Badgers shooting 8-2 and leading by only 3. Bronson Koenig now leading all #Badgers with 7 points. Josh Hart has 10 for Villanova. #Badgers having "youth" issues with Iverson and Trice. Both making mistakes of inexperience. Need to find composure. So far, UW finishing well around the rim: 4-for-5 in the paint. Showy with a sweet drive for the bucket. Badgers up 22-19 with seven minutes to go in the first. #Badgers shooting 64.3 percent, lead 22-19 with 7:02 left until halftime. Seniors have accounted for 20 of those points. Check that: seniors have 18 of the 22 points right now for the #Badgers . Gard to #Badgers : "We've got to finish the possession." Talking about grabbing the D rebound. Points in the paint: #Badgers 10, Nova 2. #Badgers Hayes with 1 FGA so far. Bet he gets a touch on this trip. We've got a grinder in Buffalo. Pritzl in for #Badgers . Gard looking for a spark. Pritzl making his NCAA tourney debut. Vitto Brown with three 3-pointers. Wow. Three treys for Vitto so far today. Badgers up six. Gard to Anthony Jordan: That hasn't been called all year. Badgers super small right now. Hayes, Iverson & three guards.